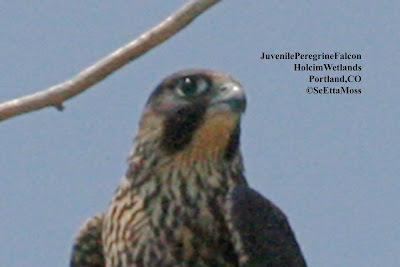 I believe it had field marks consistent with a juvenile "American" (F.p. 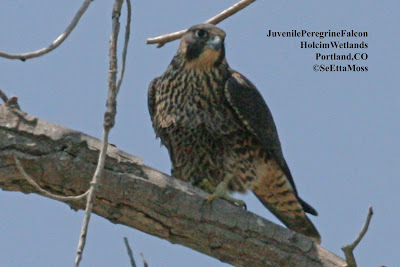 anatum) Peregrine Falcon described in detail in Brian Wheeler's Raptors of Western North America (p. 474--not the 'lightly marked type'). 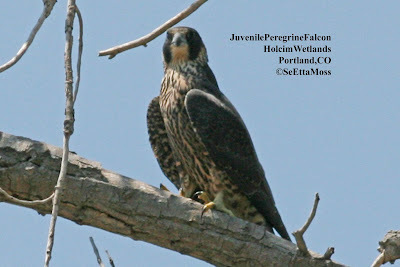 Today while checking for late nesters on my Colo Breeding Bird Atlas block east of Florence,CO, I saw this juvenile Peregrine Falcon fly down the Arkansas River and into some adjacent cottonwood woodlands in pursuit of a meal. It apparently was unsuccessful and perched in a tree where I took some of these pics. While perched, the apparent resident Redtail Hawk flew nearby calling it's displeasure at this competition in it's hunting grounds. Though the Peregrine didn't leave, it was clearly paying attention as it moved it's head in a manner I have seen done by Great Horned Owls which was amusing when done by a falcon. 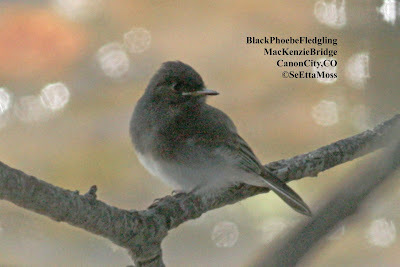 On 8-4-09 I found these Black Phoebe fledglings near the MacKenzie Bridge over the Arkansas River on the east edge of Canon City, CO. Earlier this summer I found fledglings being fed by a parent right where I found these new fledglings. So it is most likely that the same set of parents renested and these are the offspring.